Insightly and Zoho are two customizable and fully-featured customer relationship management (CRM) tools. While Zoho is the better choice for most small businesses out of the two based on its features and affordable plans beginning at $12 per month, Insightly is better for teams needing project management features with plans beginning at $29 per month. Zoho is particularly best for online businesses that generate leads through social media, like ecommerce sellers, that want an affordable CRM with a customizable sales process due to its social media lead capture feature. Zoho offers a Free plan with basic CRM functionality for up to three users, as well as paid plans beginning at $12 per user, per month, allowing smaller businesses to start with a plan that fits their business today and as they grow. Insightly is a powerful CRM that, in addition to robust contact and deal management features, includes project management tools. This makes Insightly a good choice for agencies and designers that sell project-based services. Paid plans start at $29 per user, per month, but there is also a Free plan for teams of two or less, making it also a good option for solopreneurs who want an affordable CRM and project management tool. To compare Insightly and Zoho, we considered how each handles contact management, sales opportunities, and reporting features. 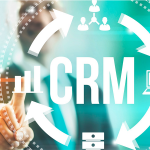 We also looked specifically at how the CRM allows users to automate important aspects of the lead generation and sales process, as well as managing customer projects. Finally, we evaluated features like affordability, overall ease of setup and use, mobile access, and the customer support available from each company. Price and affordability: Price is important for small businesses, and we evaluated the features offered at each price point, the overall value, and whether or not a free-forever plan is offered. Ease of use: We looked at how much work is involved in getting the software set up, and how easy it is to use based on the tasks salespeople do on a day-to-day basis. Lead and contact management: Tools included for generating, nurturing, and converting leads into customers, and how the software allows users to organize and communicate with contacts, were considered. Sales pipeline: We evaluated how easily users are able to move sales opportunities from the inquiry stage through the sales process, including whether the software allows users to automate steps in the process. Email tools: We looked at each CRM’s email tools, like templates, tracking, and automation, and whether it syncs with Outlook or Gmail business email. 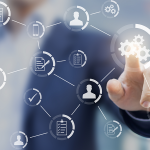 Integrations: We evaluated how well the software connects and shares information with common third-party software through extensions, integrations, and apps. We choose Zoho CRM as the best choice for businesses that need a reliable CRM at an affordable price, based on ease of use, core contact management features, and customizability. Zoho offers both contact and sales management in addition to project management tools that make it ideal for businesses like agencies and designers who manage customer projects. 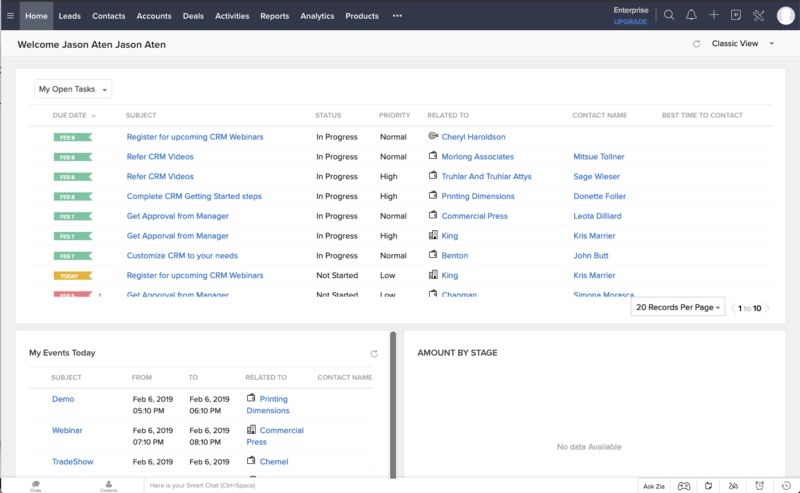 Insightly and Zoho both include common CRM features like lead, contact, and deal management, as well as sales pipelines and customization options. Both also offer free-forever plans for small teams. However, higher-tier plans are less expensive in Zoho, which begin at $12 per user, per month, compared to $29 per user, per month from Insightly. Zoho CRM offers a free-forever plan for teams of three or less, as well as paid plans ranging from $12 to $35 per user, per month. All plans include lead, contact, and deal management features, while paid plans add advanced customization, reporting, and lead generation functionality, including social media lead capture. Zoho’s Free plan includes basic contact management features like lead generation, sales opportunities, contacts, and reporting for up to three users. It also integrates with Twitter and Facebook, allowing users to feed leads from their social media networks into their sales process. While the Free plan lacks many advanced features, users can create email templates and one automated workflow for each module (contacts, deals, accounts, and so on). The Free plan doesn’t include sales forecasting, advanced workflows, or process management features found in the higher tiers, but does offer an additional user compared to Insightly. Zoho is our pick for best CRM for social media integration, and is best for solopreneurs or small businesses that need basic multi-channel lead, contact, and deal management. Zoho’s Standard plan is $12 per user, per month, and adds additional features like lead scoring rules, email insights, and custom reporting and dashboards. Users are also able to store up to 100,000 records and can customize fields for contacts, leads, and deals. Compared to the Free tier, the Standard plan allows for more control over setup and reporting with up to 100 custom reports, 10 custom fields per module, sales forecasting, and 10 custom dashboards. Zoho’s entry-level paid plan is far less expensive than Insightly, and while it lacks project management tools, it includes many features like workflow and automation tools, as well as rules-based lead scoring. The Standard plan is the better option for small businesses that want to create automated email campaigns based on social media and landing page generated leads. Zoho’s Professional plan is $20 per user, per month. It includes everything from the lower tiered plans while adding inventory management, territory and lead validation rules, and unlimited records. Zoho also includes the SalesSignals feature, which provides real-time notifications that can be configured by sales reps to alert them to lead activity like email opens or new deal stages. Compared to Insightly’s Professional plan, this plan is less than half the price while including much of the same functionality, with the exception of the project management tools. This plan is ideal for sales teams that need an affordable, fully-featured CRM that can be customized to fit their sales process, especially for brands and businesses that want to segment leads generated through online marketing campaigns. Insightly offers a basic free CRM plan with contact management and project management for two users. Paid plans are $29 and $49 per user, per month, and include popular CRM and project management functionality like email tracking and project management pipelines. Insightly pricing is generally more expensive than Zoho’s, though it includes project management tools. Insightly’s Free plan includes up to two users and provides basic CRM functionality like contact management, tasks, and sales opportunities. These features are limited compared to the paid plans, and it includes fewer free users compared to Zoho, though it does include project management tools, which aren’t available in Zoho and are unique in a free CRM. This plan is a good choice for individuals or partners who don’t need advanced sales tools but want to sell and manage customer projects. Insightly’s Free offering is a good option for freelancers who provide project-based services to clients and want to manage the entire customer relationship cycle in one place, like graphic designers, video producers, interior designers, and event planners. Insightly’s Plus plan is $29 per user, per month, and includes customized project pipelines, email tracking, lead assignment, and a business card scanner that allows you to add leads directly from cards. Users are able to manage up to 100,000 records and send 2,500 bulk emails a month, making it ideal for sales teams that need to send highly-targeted drip campaigns to a select number of contacts. However, this plan does not include the workflow automation found in the Professional plan, or in the entry-level paid plan from Zoho at a much lower price. For this reason, it is a better alternative compared to Zoho for sole proprietors or businesses with a simple, non-automated sales process. The lead assignment features, however, make it a good option for companies with specialized teams for different types of leads based on geography, industry, or company size. The Professional plan is $49 per user, per month, and lets you manage up to 250,000 records, which is less than the unlimited records allowed by Zoho at this tier. The trade-off is that it includes several advanced project management and customization options not included in Zoho, as well as role-based permissions and workflow automation tools. The Professional plan includes a wide variety of third-party integrations that expand its robust capabilities, similar to the extensions and apps available for Zoho. The Professional plan is highly customizable and features advanced project management tools. This plan is a good choice for teams that want to have their managers control and set roles and permissions for their team members, as well as those who need the ability to highly customize all aspects of the CRM with custom fields and pipelines. It is ideal for contractors, landscape designers, architects, and consultants. Insightly and Zoho are both full-featured CRMs, but they can be overwhelming due to the extensive amount of customization available. Neither are especially user-friendly, as they pack a large number of features into the interface and require a considerable amount of setup to take full advantage of the tools available. Insightly has a more recently updated user interface, making it easier to navigate, while Zoho has setup wizards that make it somewhat easier to get started. Zoho is highly customizable, and the interface is relatively straightforward. However, new users may struggle to get set up on their own. Zoho does include wizards that simplify the process, but there are a lot of features packed into the software and configuring them all takes time. Zoho does include integrations that make it easy to sync your information between the various Zoho software applications. Insightly does a good job of rolling a large number of features into its recently updated, user-friendly interface. It uses a tabular list view for most areas of the interface, which may be familiar to many users, but has also added a Kanban-style deal pipeline view. Like Zoho, Insightly includes deep customization options, which means setup can be more involved, take more time, and require training and onboarding support. Insightly and Zoho both offer user self-support and online support request. Both include similar levels of customer service, though Insightly is known to be more responsive to customer service issues and feedback, making it a slight winner for businesses that prefer personal support to get set up and solve problems. Zoho provides an online knowledge base as well as how-to videos and tutorials. It also has an online community where users can find best practices and solve many common problems via peer support. Zoho offers users enhanced support options at an additional price on the paid plans, which include priority and dedicated support technicians. Insightly offers both self-help knowledge base support and email support, along with community forums that are similar to those offered by Zoho. Insightly charges for priority support in addition to the software subscription including implementation, training, and dedicated phone support. Insightly and Zoho users state that both are a good value, and meet their contact and deal management needs. Since both have a large number of users, it’s easy to find out what users think, and we looked at what they had to say about what each service does well and what it doesn’t. Our readers give Insightly slightly higher overall positive reviews. Users give Zoho good marks for the overall set of features. Users also like that it’s flexible enough to be configured for different types of sales processes. Users do wish there were better support options available and share that it can be somewhat overwhelming to get started. You can find more about what users think on our Zoho review page. Users give Insightly good marks for the ability to customize the interface, though some users find that the interface is less intuitive and more crowded compared to other CRMs. 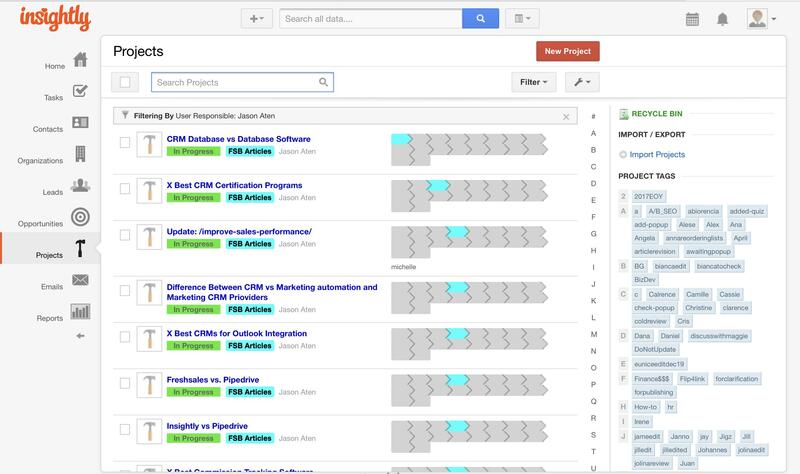 In addition, the search features tend to get bogged down with larger data sets. We use Insightly here at Fit Small Business and you can read more on our Insightly review page. If you want to find out more about how Insightly measures up to Pipedrive, check out Insightly versus Pipedrive. Both Insightly and Zoho are comprehensive CRMs that allow users to customize their sales process and configure the interface to meet their business needs. Both are flexible enough to handle most sales processes and both integrate with a variety of third-party applications like QuickBooks and G Suite. Figuring out which best fits your business depends on which features are most important to you. We recommend Zoho for small businesses looking for an affordable contact and sales management tool, especially those that generate leads through social media due to its ability to easily capture leads from Facebook and Twitter. Zoho offers a free-forever plan and free trials of their paid tiers. Visit their website for more information.